Three magic party packages are available, all of which are suitable for boys and girls aged from four years old. Each and every one is crammed full with entertainment tailored to suit your requirements and the age and number of the children. The price of each package is fully inclusive of all travel and giveaways and I will bring everything required, all I need from you is access to a 240v power socket. That way you can relax and enjoy the show too! For more information and prices please contact me using my enquiry page above. An amazing, fun forty-five minute show full of magic, comedy, juggling and balloon modelling where the birthday child becomes the star of the show! The children will laugh, shout and scream as handkerchiefs, flowers, rope and rings appear. disappear and become linked together in a performance full of colour and music. Each show is customised to the age of the children and available space and may contain puppets, plate spinning and minor miracles! Adults love to watch the show and the faces of the entranced children; it provides so many great video and photo opportunities and long lasting memories. This is ideal to end any special birthday party. No live animals are in the show. A dozen or more excited, screaming children can be unnerving for any parent. Why not let me organise thirty minutes of games with music and movement where no child is ever left out and everyone takes home a prize at the end? No bored, unoccupied or frustrated children; leaving you to enjoy the atmosphere, take photographs or focus on preparing the tea. The games are followed by the same great customised show detailed above in “Magic Party”. A full seventy-five minutes of entertainment. If you prefer, instead of games, I will entertain with thirty minutes of balloon modelling. As one of the South’s leading balloon modellers, I will create a wide range of different animals from mice and monkeys to a large octopus, all of which the children take home. This immediately follows the “Magic Party” show and both can be held before or after tea. This is more suitable for parties held at home, or where you wish to run the games yourself. For complete peace of mind, I will organise all the entertainment at the party both before and after the tea. Before tea I can organise forty-five minutes of games, entertain with balloon modelling or run a workshop on magic tricks or circus skills. You choose which you prefer; all of these options are a great start to any birthday party. During the break for tea, I set up the magic show. 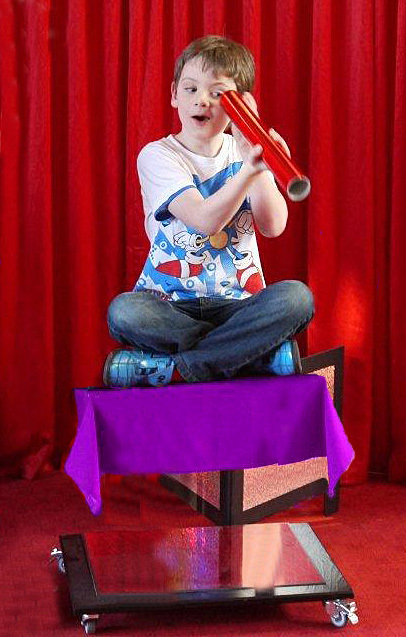 In a hall I create a special stage area with backdrops and banners – this really sets the scene generating excitement and anticipation for a special birthday magic show. 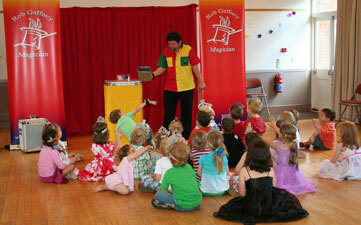 The magic show is an enhanced version described in “Magic Party” above. At the end the birthday child(ren) will take part in a magical illusion that makes for a wonderful photo opportunity! This illusion is only possible with this Total Party package. The birthday child(ren) also receive a ‘Magic Hands of Mystery’ DVD and Magic book that teaches them cool tricks they can do with household items to amaze their friends. This package is perfect for a two hour birthday party and can be tailored for any number of children, ages and size of location; it is the ideal solution for joint birthday parties held in a hall, which can be quite stressful. For parties lasting longer than two hours, I can perform games, a magic show and balloon modelling if you wish. This total package provides real flexibility in content and duration to meet any needs you have. Please contact me to discuss your requirements. I need 15 to 30 minutes before the show start time and the same afterwards for take down, depending upon which package is selected. All of my packages require access to a 240v power socket for my PA system. Both the Magic Show and Balloon Modelling are suitable for children aged from four years old and can be performed at home or in a hall. 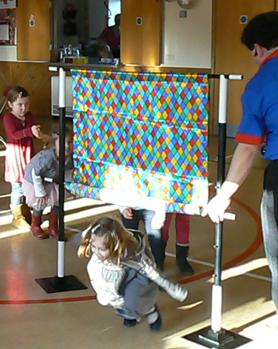 The games, in Magic Party Plus and Total Party, require the use of a hall or large room to provide necessary space. All games are suitable for children aged five and above. The workshops are suitable for older children, aged eight and above. The Circus Skills workshop requires a hall or large room to cater for flying objects, the Magic and Balloon Modelling workshops can take place at home or in a hall. Further information on each workshop can be found on the “Workshops” page; see link above. The workshops are available on their own outside of the Total Package.